Strategic Growth Opportunity Areas (SGOAs) are large, strategically attractive areas to look for profitable growth. SGOAs can come from a variety of sources, and can include new products, brand extensions, new channels, acquisitions and other initiatives. 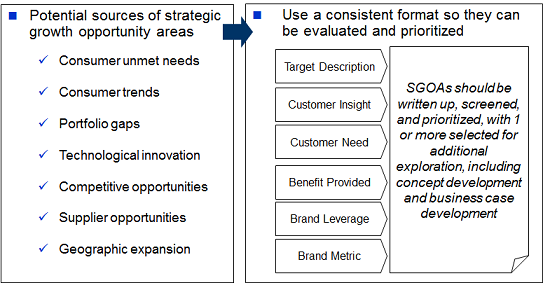 Strategic Growth Opportunity Areas should be documented in a consistent manner to allow them to be evaluated and prioritized for additional consideration. What is the full set alternative strategic growth opportunity areas to consider (drawing on strategic direction setting and focused ideation)? What benefits (both internal and external) does each SGOA offer? Which of these are judged to be most attractive? How do the SGOAs pass various screens, across strategic, customer and financial/operational screens? Can an initial business case be made to demonstrate market success potential? Once SGOAs have initially been established and documented, interim screening is performed to narrow the list. As the SGOA progresses from strategic area, to focused ideation, to specific business concepts, additional screens are used to ensure strategic, operational and customer requirements are met. To speak with an experienced innovation consultant or new product consultant from EquiBrand, contact us.